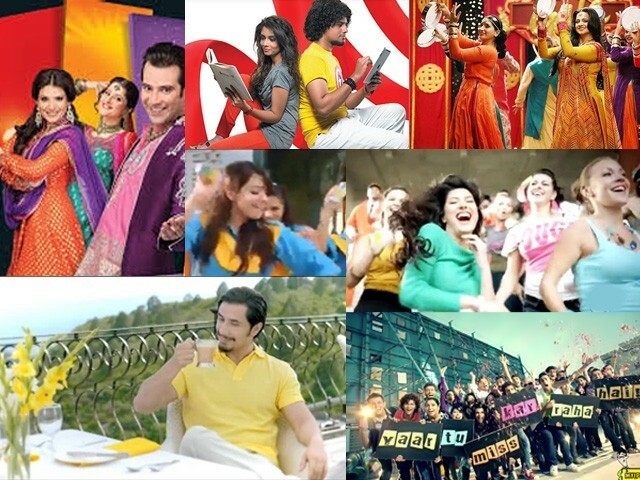 From chewing gums to cell phones, the dancing glitz has now become an integral part of our advertisements. A few days back, while I was on my way to college, I came across the road near Expo Centre, where the traffic was choked. Naturally, I flipped my hair and smiled at the people in the neighbouring cars; and what do you know, they smiled back! After that we got out of our respective cars, started dancing in the middle of the street with cups of tea that magically appeared in our hands. We danced and swirled while others clapped and hooted. Then, all of a sudden, the traffic opened up, everyone got back into their cars and drove on happily to their respective destinations. Ah! What a perfect day. Isn’t this what our advertisement industry shows us every day? Of course, the above mentioned incident never really happened and never will, not in Pakistan, not in America or even in some remote corner in Africa; it will never happen anywhere, because no one does that! No one thinks that dancing in the middle of the street, on a busy weekday, whilst sipping on cups of magic tea, is normal. From chewing gums to cell phones, the dancing glitz has now become an integral part of our advertisements. Here are a few examples where there was absolutely no need to add dance numbers and yet the directors seemed to feel the need for the redundant dance to take place anyway, making some utterly senseless advertisements. Seriously? This is the 21st century and we’ve been using the internet for a decade now, so I don’t see why this ‘exciting’ piece of information calls for a dance routine and over-the-top celebrations. I fail to understand how any of this will help increase sales for the company. Before I describe how preposterous this advertisement is, I want you all to know that it has been shot in Turkey and has employed a huge budget in its making, which makes it all the more ridiculous. Since we, obviously, don’t have terraces, colourful rooftops and small houses here in Karachi, the crew decided to go to Turkey to shoot this ‘brilliant’ (read: lame) advertisement, where everyone decides to ‘beat the heat’ by going on to their respective rooftops, standing directly under the hot summer sun, with, what I assumed to be, piping hot cups of tea and dancing away in hideously bright coloured clothing. What’s more ridiculous is that the advertisement shows this random guy, passing through in his ridiculously lavish car, who decides to join the tea-dance brigade. Someone must definitely have sent him an invite, because he was dressed just like the rest of them. Before you consume this gum, please turn over its wrapper and read the ingredients. I am sure it has some kind of hallucinogens mixed with sucrose. Why? Because this renowned actress, in the advert, bursts into a strange dance moves as soon as she starts chewing it! This TV commercial, too, is a colossal waste of money. The crew was flown all the way to Thailand just to shoot an advertisement about dancing chewing gum-addicts. The advert begins with college students, who are already dancing for some godforsaken reason and in the midst of this ‘tiring’ routine (who can blame them? The steps are beyond normal) want to feel revitalise and refresh themselves. At that moment, the renowned actress walks in and, even before tasting the gum, starts dancing, jumping and punching the imaginary punching bag in the air, showing off her rather unusual dance moves. I still don’t understand the logic behind this advertisement. I don’t think I ever will understand the link between a piece of chewing gum and a rather karate-chop style dance routine. With people peeking from their balconies (because they have nothing better to do), traffic policemen and random strangers also join the dance and start moving with the tune of the song. I never knew that a simple cup of tea could have such an effect. It truly is magical. This is perhaps the one advertisement that misinterprets the Pakistani youth to its fullest. We have such intelligent, young adults who are successful in academics and extra-curricular activities alike, yet the only image this advertisement insists on portraying is that of young people whose lives revolve largely around social media, relationship statuses, dancing on the streets and singing songs. That is not what we, the youth, do. Dear advertisers, there are so many ways in which you can make a TV commercial creative to endorse your brands; dancing and hopping across the street to some noisy tune isn’t helping. Instead it is annoying your consumers and portrays a rather rude and superficial image of Pakistan. I promise you, intellectually stimulating advertisements will most-definitely up your sales. I totally endorse your argument. My son really likes the tune of that ad and the simple dance steps. In fact I’m humming that tune in my head as I type. You know what… I think I’ll go have a cup of tea with him. Haven’t seen any of these ads and it would have been nice to see links of the ads. oh i love this blog post! way to go Rakshinda!! !